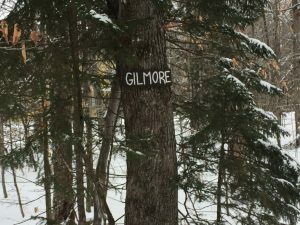 Way back when, in the 80’s, when I began my career at the College and started skiing regularly at the College-owned Rikert Ski Touring center at Breadloaf, some “newer signs” were being mounted on the trees, indicating new trail names. 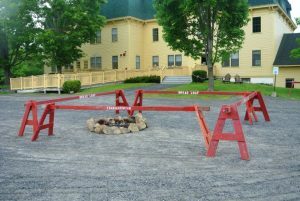 Apparently, until a few years previously, the trails had descriptive names, such as “Turkey Trot”, “Snow Snake” and “Figure 8”, and these, rather than their newfangled names were still commonly used, but the college trustees chose to rename these trails to honor famous Middlebury figures – some of which were truly connected to the Breadloaf campus, and some whose direct connection to the environs still seems a bit mysterious. 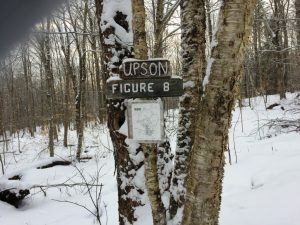 Nonetheless, most of the old names are now only vague memories of the old-timers, and the 30+ year old new names are used on the modern trail maps, as well as the signage out on the trails. 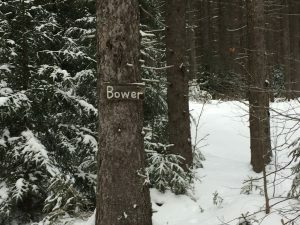 I thought it would be fun to ski all of the trails named after historical figures, and find out a little bit about each of them. 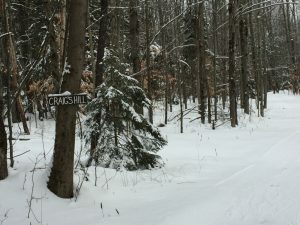 Leaving the open field, and entering the woods, the first trail most first-timers ski onto is the Battell Trail. 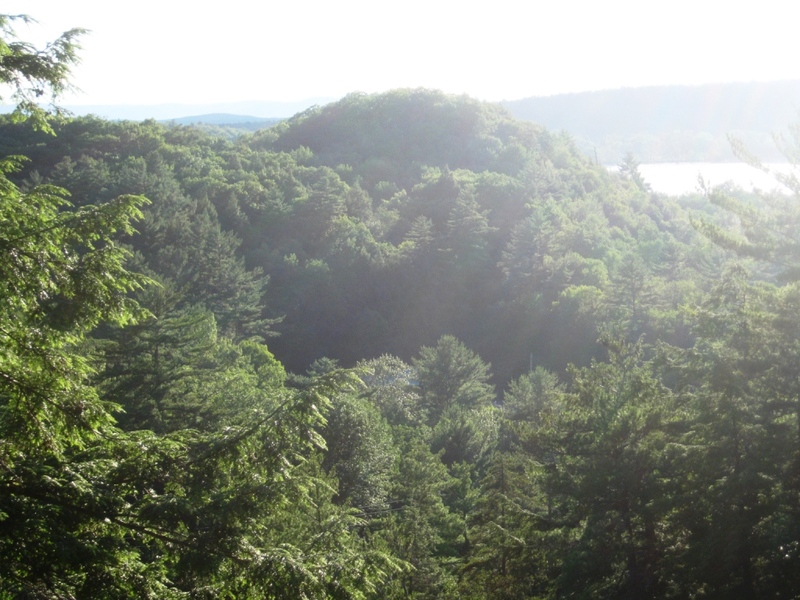 It is only fitting that this well-loved trail is named after Joseph Battell, a scion of Middlebury who built the Breadloaf Campus as a mountain resort, and donated it to Middlebury College to create the Breadloaf Campus. Full disclosure here – my endowed chair at the college is named after a few of his descendants, so I guess I too have benefited financially from his generosity! I could write a whole post on Battell, but there are a lot more names coming. 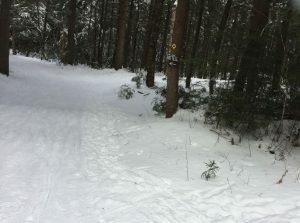 After a short climb on the Battell Trail, I took the right turn onto the Cook Trail, a delightful little dipsy-doodle descent, complete with a mini-jump that has been part of the trail for as long as I have skied it. 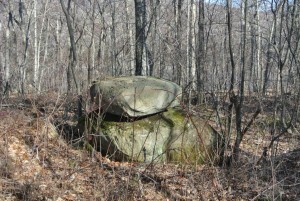 The Cook Trail is named after Reginald Cook, an English Professor at the college, and also director of the Breadloaf School of English, the summer Masters Degree program, in the mid-20th century. 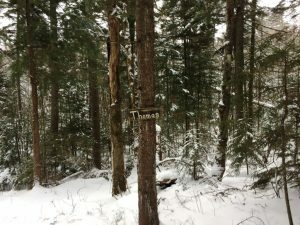 The next named trail, “Thomas” was one I had no idea on. Rebekah, a college archivist, did a little sleuthing for me, and suggested that the trail is named after John Thomas, the Middlebury College President from 1908-1921. He is also known for having founded the Breadloaf School in 1920, so it makes sense that he would be honored with a posthumous trail name! After a short stretch rejoining the Battell trail, I finally got to a trail named after an actual skier! 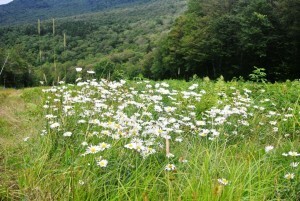 The Bower Trail, named after Middlebury Alum John Bower ’63, arguably the most famous Middlebury College Athlete. In addition to winning the NCAA Championship in cross-country skiing in 1961, he also was on the US Olympic Teams in 1964 (Innsbruck) and 1968 (Grenoble), and returned to coach the Middlebury Ski Team before leaving to direct the nordic program at the US ski team. My wandering path next brought me to the Freeman trail, named after Professor Stephen A Freeman, who passed away in 1999 at the age of 478 (OK maybe I stretched that a little, but he was over 100!). Freeman is known for bringing the Middlebury language programs to international prominence, and establishing the schools abroad. I don’t know of any special connection he may have had to the Breadloaf Campus, or the Rikert Ski area. Does anyone else know? 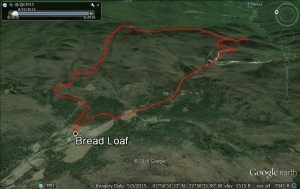 I next did a short loop on the Gilmore trail, named for the adjacent Breadloaf Dormitory by the same name. I wasn’t able to connect this trail name to any Middlebury College name of prominence, but my college archivist connection Rebekah guesses that it was the name of a local landowner at some point. Looking on geneology confirmed that there were indeed Gilmores living in Ripton in the 19th century, but I couldn’t find much more, although I suspect that time spent looking over Ripton land records could confirm or deny this. I will also take a look around some of the local cemeteries this summer with my eyes open for the Gilmore name. I did, however, find a blog post describing past alcohol-fueled literary debaucheries by some of the summer residents of Gilmore House! 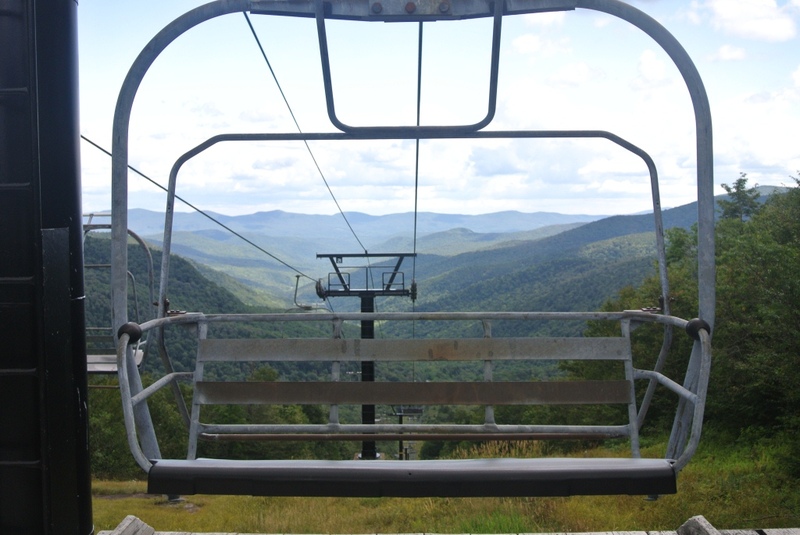 The next named trail on my jaunt through the woods, is another one named after an actual skier, the Sheehan Trail, named after “Bobo” Sheehan, Middlebury Class of ’44, whose name is also attached to one of the chair lifts at the Snow Bowl. Sheehan, a born and bred Vermonter (from Newport), also the was the coach of the college ski team from 1947-1967, and was also the father to professional golfer Patty Sheehan. Although I suspect that he was more known for his prowess as an alpine skier, I think he deserves a nordic trail as well. 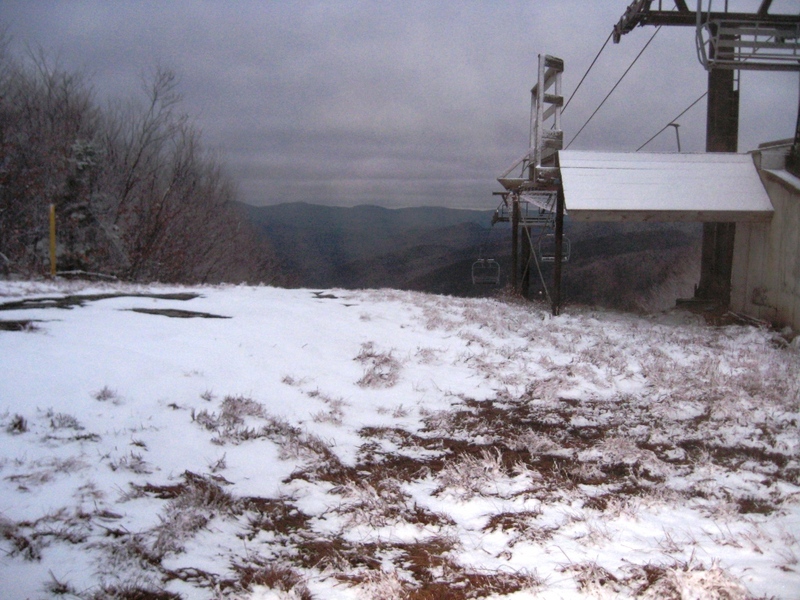 The next named trail, Frost, needs no introduction. He lived here, wrote here, and walked here. And yes, probably slept here as well. 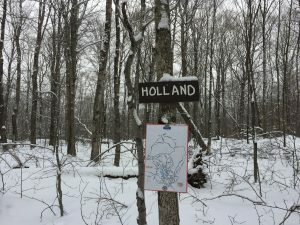 Although I didn’t ski at all on the Holland Trail, I did pass by the sign for it. This was a tough one to figure out, but a friend who is a former Rikert Employee and Google Whiz (Thanks Nate!) came up with a likely candidate, Laurence Holland, a longtime Breadloaf professor and Chairman of the English Department at Johns Hopkins, who apparently met his demise while swimming unsuccessfully (That is a euphemism for “drowned”) in the Ripton Gorge in 1980. The next trail name as a little bit of a mystery as to its name, “Mandy”. I have heard two explanations as to its origin. 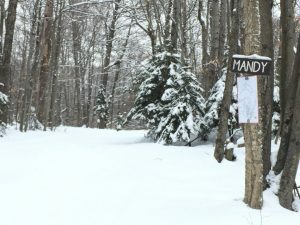 The more reputable of the sources seems to think that the trail name is associated with a former Breadloaf employee whose last name was “Mann”, while another current employee thought she had heard it was named after someone’s dog. 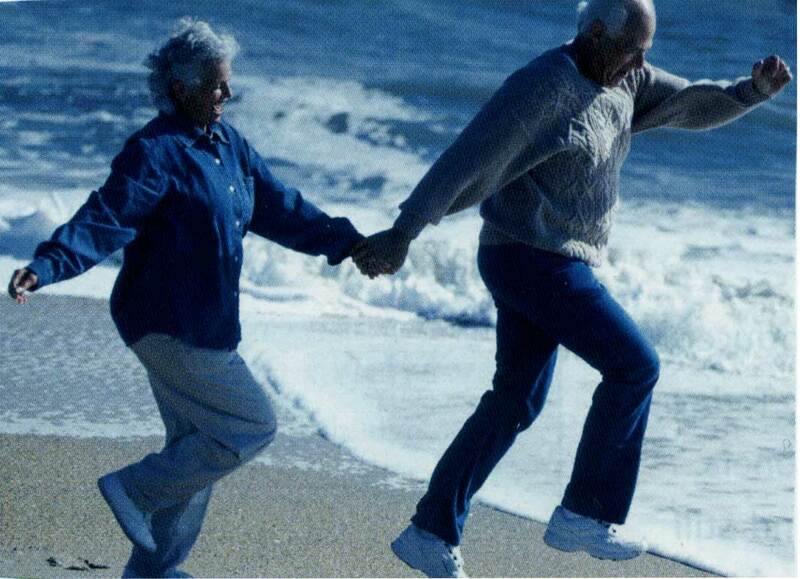 I am going to have to ask some old-timers about this one! 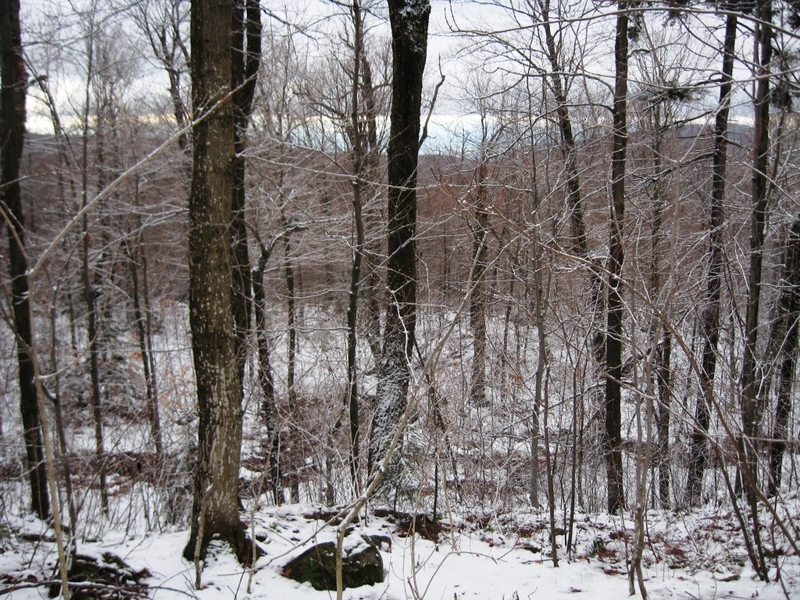 After rejoining the Frost Trail, I took a sharp left turn, and came down from the upper reaches of the old racing trail, and descended the section known as “Craig’s Hill”. Chatting with a former Rikert employee, he seems to think that the Craig name was associated with a landowner in the area, past or present. 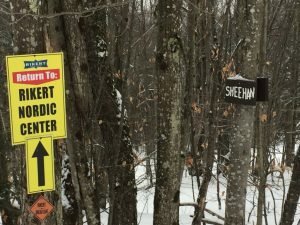 Most people who ski at Rikert probably don’t give too much thought to land ownership, presuming that all the land is either Middlebury College property, or part of the national forest. Actually, the land is a patchwork of private, college and public property, and I know that expansion of the cross country skiing is limited by the needs of local property owners. W. H. Upson had been a prolific writer for the Saturday Evening Post, as well as other periodicals during the mid 20th century. Although he lived in quite a few parts of the country, including a stint at the Caterpillar Tractor Company in Illinois,when he eventually settled in the Middlebury area, he frequently attended the Breadloaf Writer’s Conference, and taught creative writing on occasional at Middlebury College. The house on RT 125 called “Earthworm Manor” is also his former home, and is still used as a Breadloaf School of English residence. 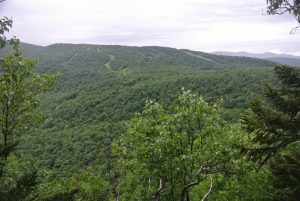 The last descent down to the Breadloaf Barn, home of the Rikert Center, is down a trail now labelled as the Tormondsen Trail. 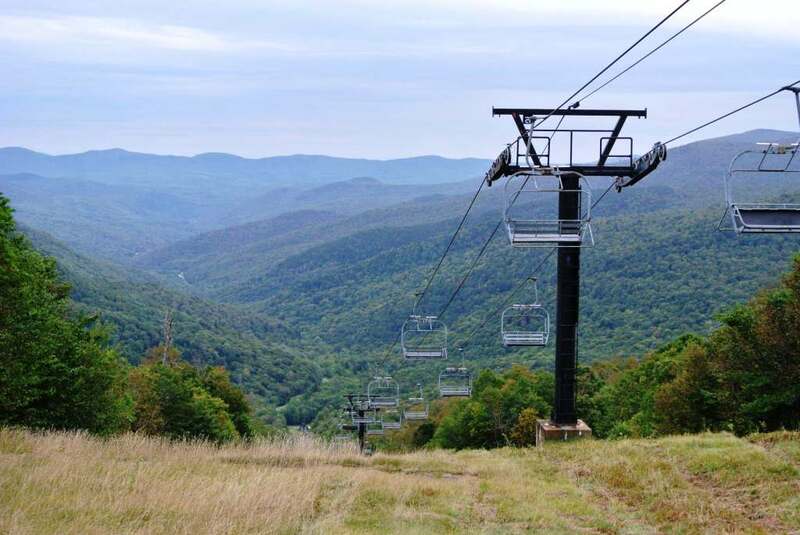 This trail, the current racing trail, is named after John Tormondsen ’82, a former All-American skier and generous donor to the college – and even younger than me! I have presumed that he donated a lot of money to the college to support the Rikert area’s recent upgrades, as well as making the donations such that the common room of the building where I work, Bicentennial Hall, is also named after him. Thanks! On a more somber note, the trail maps for this final descent also still also bear the Cubeta name. The now-deceased professor for whom this trail was named long ago, was a powerful English Literature professor, Provost of the College, and head of the Breadloaf School. 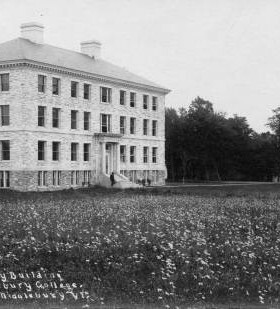 In the Middlebury College version of #metoo, about 30 years ago, enough men started talking to each other, and realized that they weren’t the only ones being sexually harassed by this professor. Now, you might guess from the length of this posting, that this was an epic long ski tour. Nothing could be further from the truth – I covered a lot of Middlebury College history in about 4 miles! 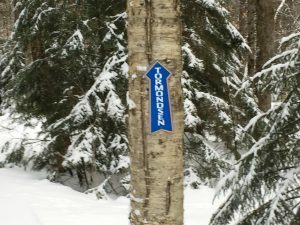 This entry was posted in Midd Blogosphere and tagged #metoo, Breadloaf, Breadloaf School of English, Middlebury College Snow Bowl, Rikert, Ripton, Ski Touring on February 21, 2018 by Jeff. 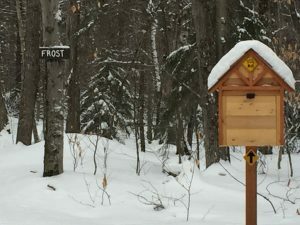 In this blog, I have often sung the praises of the trail runs accessible from the Brooks Road trailhead, reached after a few hundred yards on the forest service road on the right between the Rikert ski touring area and the Snow Bowl. The easiest run from here, terrain-wise is a roughly 9 mile run which I have described in the past, albeit six years ago. A good chunk of this run actually takes place on Brooks Road itself, a forest service road which is open to cars during the summer months, although rarely driven, and is used by snowmobilers and cross-country skiers in the winter. In late March? Since it has no snow anymore, and probably never had much this winter, it is closed to snowmobiles, but has not yet been opened to other motor vehicles, making it even better for running. 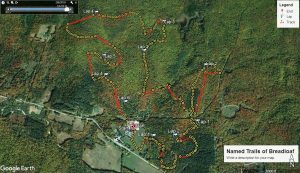 The run starts off with the most challenging climbing of the route in the first mile and a half on the dirt surface, until it levels off for another mile, reaching the point where the snowmobile trail up from the Sugar Hill Reservoir joins from the right. Those looking for a shorter run or hike can just take a right turn here, for a 6 mile out and back! On this run, however, I will be returning by this side trail. Another mile on the dirt road, and another climb, not as long and steep as the climb at the start of the road, brought me to the high point of the run, with the total vertical climb a modest 700 ft. One of the big hurdles for road runners transitioning to the trails, especially competitively in Vermont, is the challenge of getting used to long, sometimes relentless climbs. I have found that this section of dirt road makes for a good place to time trial to measure one’s progress in the hills. Since it is on a dirt road, the footing is consistent, eliminating the variable of trail condition, so I will run this quite a few times each season, making a mental note of my time on the ascent, watching how my times get faster as the season progresses. 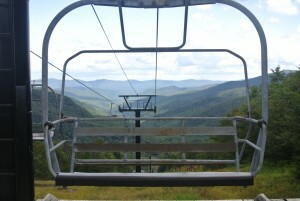 After crossing the pedestrian bridge over the upper reaches of the Sucker Brook, I headed on the trail into the woods, taking a right turn onto a ski and mountain bike trail which is part of the Blueberry Hill network. 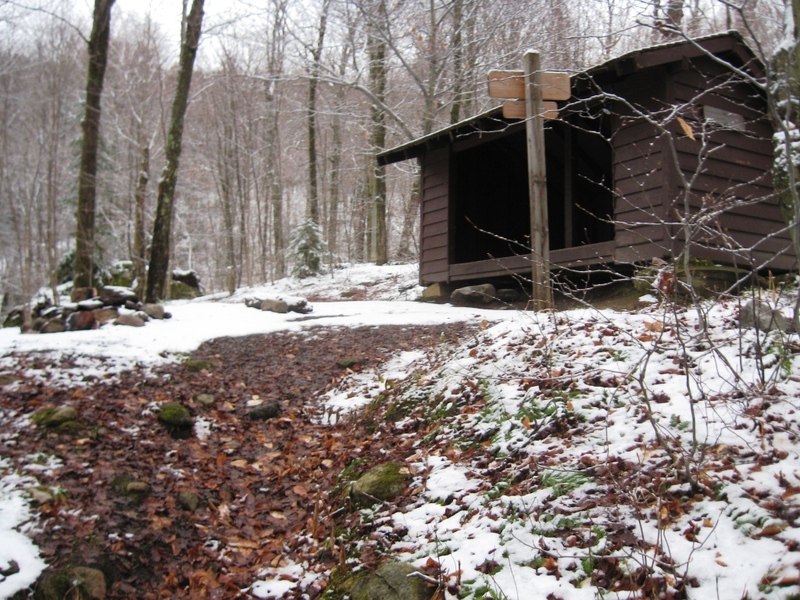 This particular trail used to be a regularly groomed part of the Inn’s system, but has not been groomed in the last few years due to the destruction of several small, but critical bridges along the trail by Hurricane Irene. 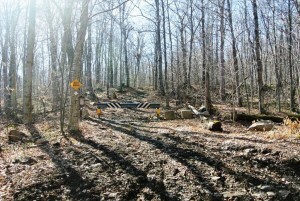 The Moosalamoo Association, a non-profit, is currently raising funds for their repair, but fortunately the bridge washouts do not affect the use of these trails for running once the snow is gone. 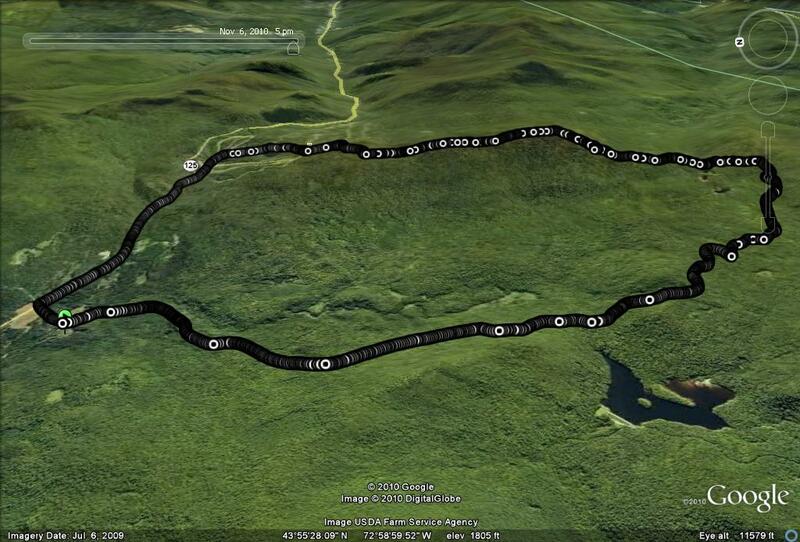 Staying on this trail for a little over a mile, and veering gradually to the right, this route took me to the dirt road access connecting the Goshen-Ripton road to the reservoir, and I took the right turn towards the reservoir. This road provides easy access for boaters and fishermen who need the convenience of driving to haul their gear to the lakeside. 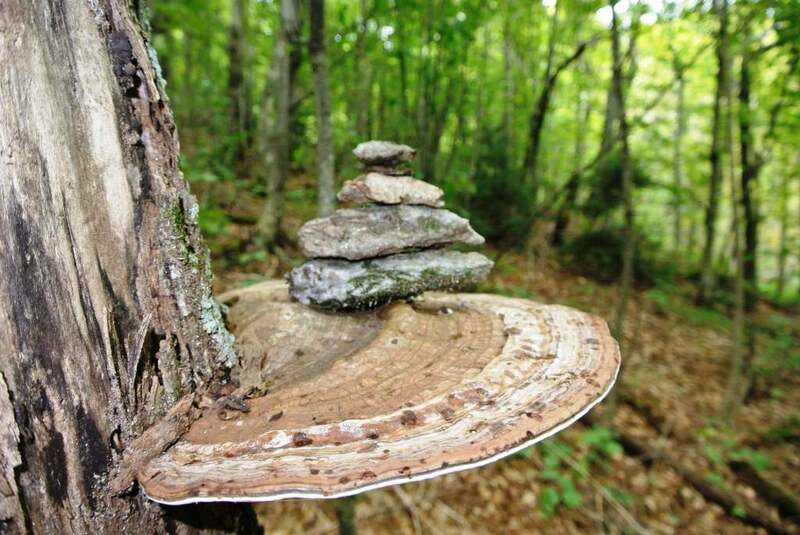 I have enjoyed noticing quirky rock cairns, built and left alongside trails and streams, and commented on them in past blog entries. On this run, I noticed a few rounded rocks, far too large to have been placed there by humans, neatly stacked alongside the road. Perhaps the glaciers didn’t want us to get lost? A few minutes on the dirt road finally took me to the shores of the Sugar Hill Reservoir. This body of water was created exactly 100 years ago as the highest altitude component of the Silver Lake hydroelectric project, which culminates far below on the shores of Lake Dunmore. While this scenic lake is open to recreational use, it’s primary function is to store water for the hydroelectric project downstream, as well as flood control, and as a result its depth fluctuates tremendously, season to season and year to year. This spring, with our weak snowfall, the water level is particularly low, although it was interesting to see that it was still almost entirely frozen over still despite our warm late winter. I also noticed a fair number of “improvements” since my last description of a run here. 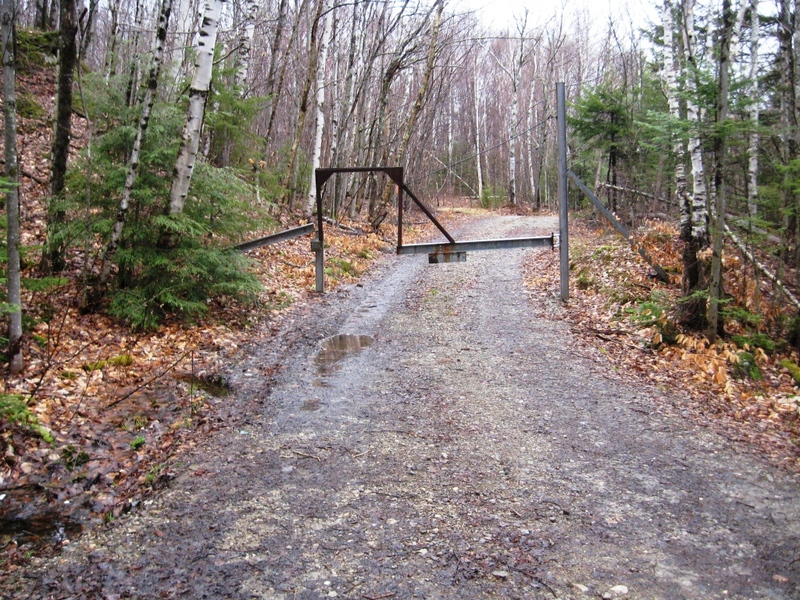 There used to be a quirky looking gate across the section of trail heading over the reservoir dam, clearly built to as not to behead errant mountain bikers, but this has been replaced by a more decorative forest service gate, and to my surprise, a mailbox. You’ve got mail? 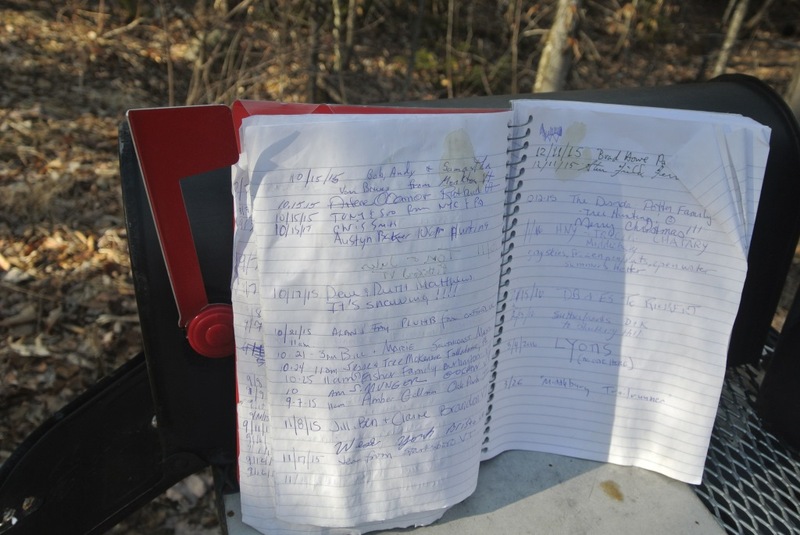 Out of curiosity, I opened the mailbox and saw that it held a logbook to be filled out by those passing through, and I couldn’t resist the temptation to sign it with my blog moniker. A little later down the trail, I realized that I should have added some sort of comment along the lines of “Happy Easter Egg Hunting”, since it was the day before Easter. 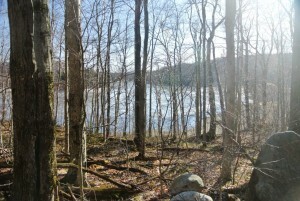 The next short section involved crossing the reservoir dam, and locating the trail on the far side, offering a snowmobile connection between the water and Brooks Road, and this involves a short climb of a little over a half mile, with one final view of the reservoir through the trees, which will soon be obscured as the season leafs out. Returning to the Brooks Road in this way, I took the left turn for the easy descent back to my car, and the conclusion of this scenic, and despite the mileage, not terribly challenging run. 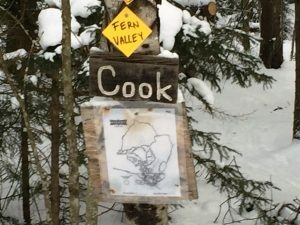 This entry was posted in Midd Blogosphere and tagged Blueberry Hill, Brooks Road trailhead, Hill Climb, Lake Dunmore, Middlebury College Snow Bowl, Rikert, Running, Sugar Hill Reservoir on April 1, 2016 by Jeff. 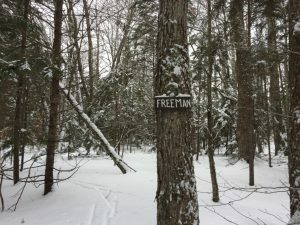 The Moosalamoo National Recreation Area, the region which encompasses many of the runs on this blog, is one of the wonderfully underutilized outdoor resources in the northeast. This region, roughly delineated by Rt. 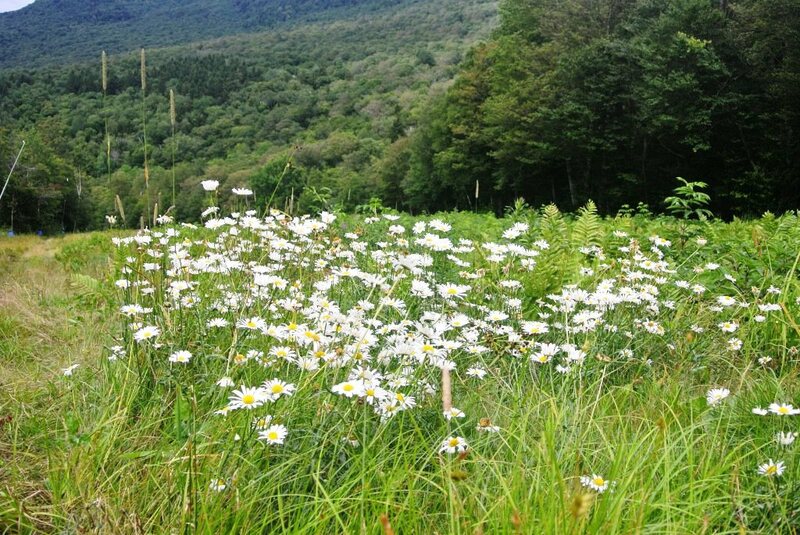 125 (the Middlebury Gap road) to the north, the main ridge of the Green Mountains to the east, Goshen and Brandon to the south, and Lake Dunmore to the west, provides a treasure trove of places to explore right at our doorstep in Addison County. 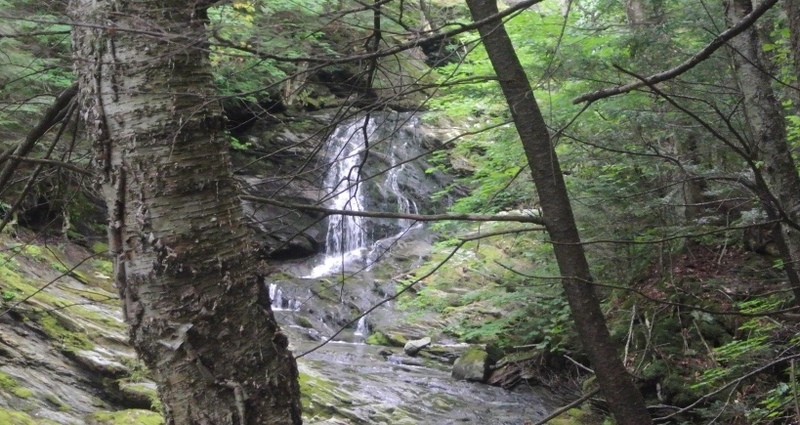 While it lacks the alpine terrain and rugged mountain scenery of the Adirondacks or even the higher peaks along the Long Trail, its smaller rolling peaks, and numerous lakes and meadows, forests and streams could provide a lifetime of outdoor recreation for most people. In other words, with its less drastic, comfortably scenic terrain, it is an ideal place for trail running! I have been eyeing my maps recently, looking for interesting “point-to-point” runs which might make for good runs with friends to share the driving at each end. A free, detailed, and USUALLY (note foreshadowing) accurate map of the Moosalamoo Region is available, free of charge, at the Middlebury office of the Green Mountain National Forest, just south of town on Rt. 7. I had some suckers, I mean fellow runners lined up to work out a car shuttle and accompany me on one of these runs, in the persons of a few of our summer research students at Bicentennial Hall. Actually, since these guys are on the varsity cross country running, I had my work cut out for me. Fortunately, I sort of knew the way, they did not, and I refused to part company with my map. 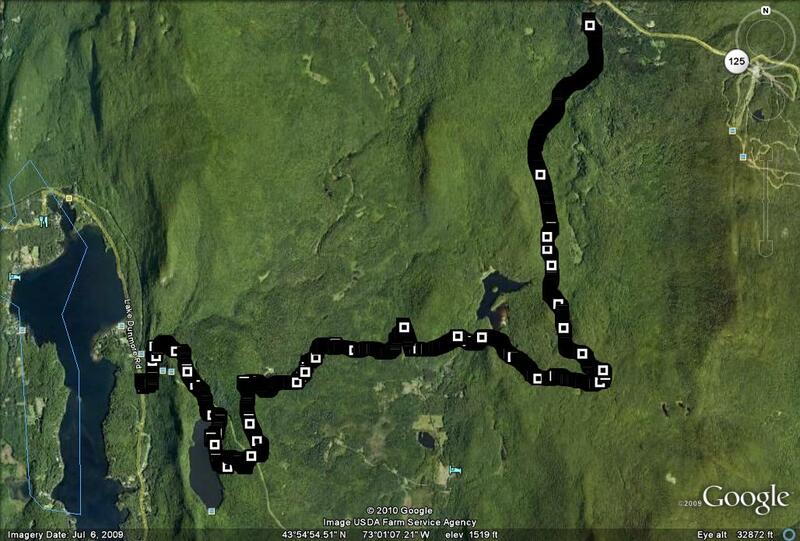 This run’s goal was to run a complete traverse of the Moosalamoo region, without actually climbing Mt. Moosalamoo itself, for obvious reasons. With this in mind, we started in the far Northeast corner of the region at the now familiar Brooks Road trailhead, right below the Snow Bowl, a short distance from Rt. 125. 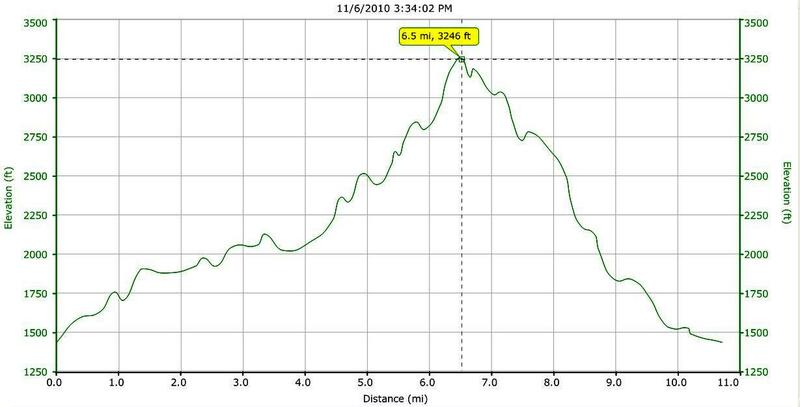 The first few miles of this run follow the route described a few months ago in the posting entitled “A Tale of Two Weekends.” As a result, almost all of the climbing was done in the first three and a half miles of the run, the ascent of Brooks Road. From the start, my two young trail running acolytes were chomping at the bit to dash up the first ascent, but I reminded them at I was more or less the same age as their fathers, so they relented. 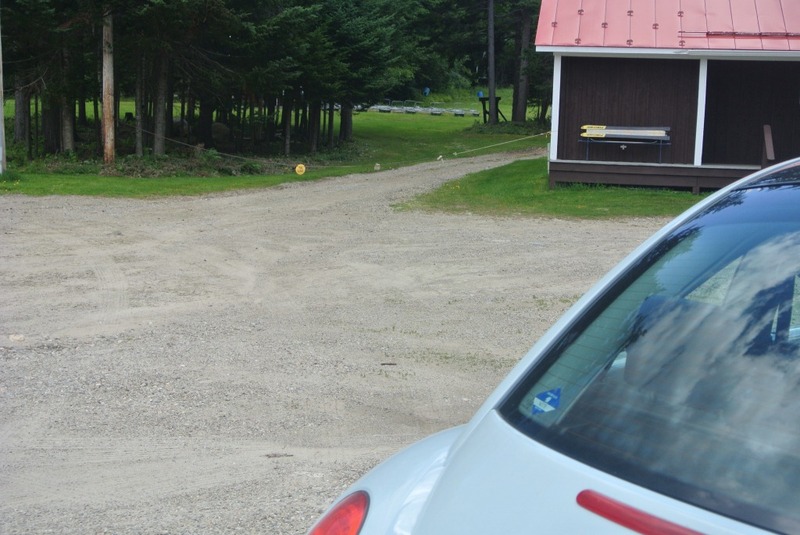 I also reminded them that it was my car awaiting us at Lake Dunmore, and I had the key. Smart Kids! The weather at the start was cool and partly cloudy, ideal for running, but as we proceeded up the dirt road, the rain began, and gradually increased in intensity. By the time we reached the terminus of the Brooks Road, it was an all-out downpour. Heading back into the woods for true trailrunning, we turned right onto the Sucker Brook Trail for a few miles of gradual descent through the Blueberry Hill nordic ski trails. 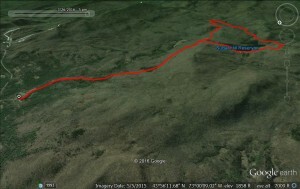 This run would be more or less running parallel with the Sucker Brook over its duration, and we would run closely alongside it again at the run’s completion. 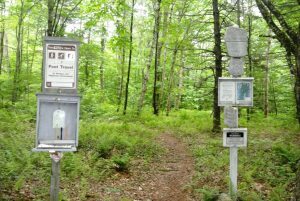 When the trail emerged from the woods onto the Sugar Hill Reservoir access road, instead of turning right to return to the start, we bore left downhill until we reached to Ripton-Goshen road. At this point, we were heading into terrain where I had never traveled, so I was depending on my trusty Moosalamoo Region map for guidance. Despite the fact that it was now quite soggy, it was still legible. 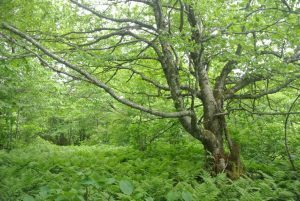 The map indicated that a trail leading towards our desired destination should be found immediately across the road, but we quickly realized that it was passable, but far more overgrown than we had anticipated. It appeared to be more or less unused, since the previous editing of my trusted map! Rather than loose face with my more fleet-footed young friends, I realized that a right turn on the Ripton-Goshen road should lead us to another VAST snowmobile trail, which in turn should get us to Lake Dunmore. This time, my directions fortunately proved more accurate, and the desired trail appeared on cue after about a quarter mile. A left turn on this well-marked VAST trail wound through some of the least traveled sections of the route, and after a few miles concluding with a very steep, but short climb, joined up with the dirt road connecting Silver Lake with Goshen, part of the first Silver Lake route described on this blog last summer. While all of us were starting to tire a little at this point, the sun broke through for what promised to be a brilliant sunset, so rather than merely descend on this dirt road to our waiting car, we threw in one last short climb, taking a left turn until we reached to Goshen parking lot for Silver Lake, where we finally began the final descent. The trail down to the Leicester Hollow trail was a little bit slippery from the rain, but taking it easy made for a safe trip. 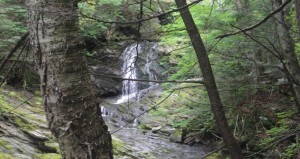 A right turn on the Leicester Hollow trail, followed by a short stretch along the shores of Silver Lake and a final descent down to the Falls of Lana parking lot could have finished a great run. As we ran alongside the Sucker Brook once again, we noticed the setting sun shining through the trees over the top of the Falls lookout, so we had to stop and enjoy the view. After soaking up the early evening sun, we finally completed the run. This ended up being one of the longest runs to date on this blog, measuring in at slightly more than 11 miles, with about a thousand feet of climbing, offset by an even greater amount of descent. Needless to say, I am eyeing my map (a new copy, after all, it is free!) for other good point-to-point runs to report on later this summer. 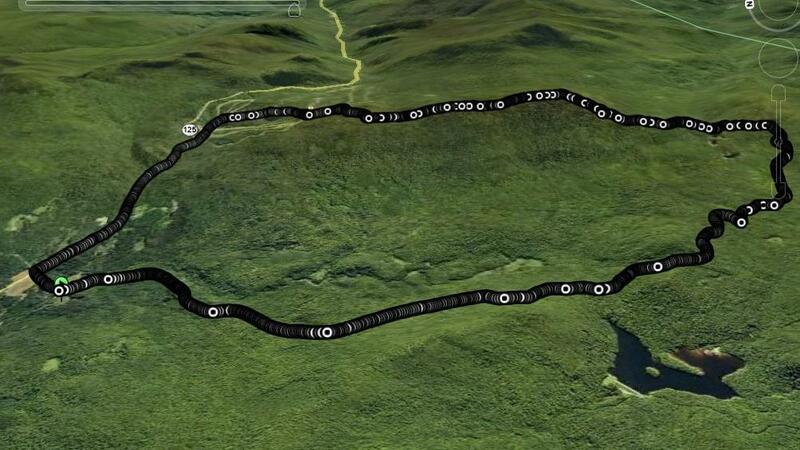 The Google Earth/GPS track of this run really shows off the breadth of terrain covered, from the Snow Bowl in the Northeast corner, past several major bodies of water, to its conclusion near the shores of Lake Dunmore. 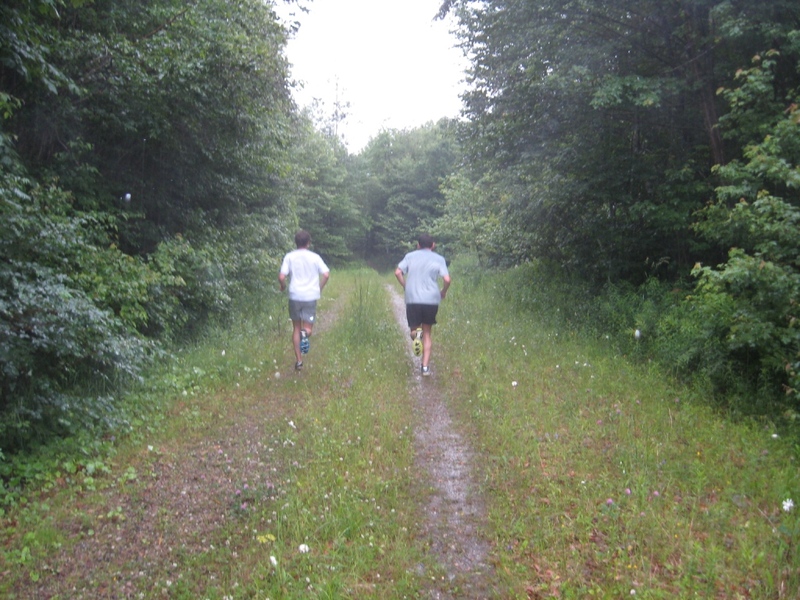 This entry was posted in Midd Blogosphere and tagged Blueberry Hill, Brooks Road trailhead, Hill Climb, Middlebury College Snow Bowl, Running, Silver Lake, Sugar Hill Reservoir on July 7, 2010 by Jeff.